NSW Health issued a fresh warning yesterday as measles cases across the country continue to climb. This new case brings the state’s measles tally to 35 since Christmas, and people who may have been in these areas are advised that symptoms could appear up until at least 23 April. 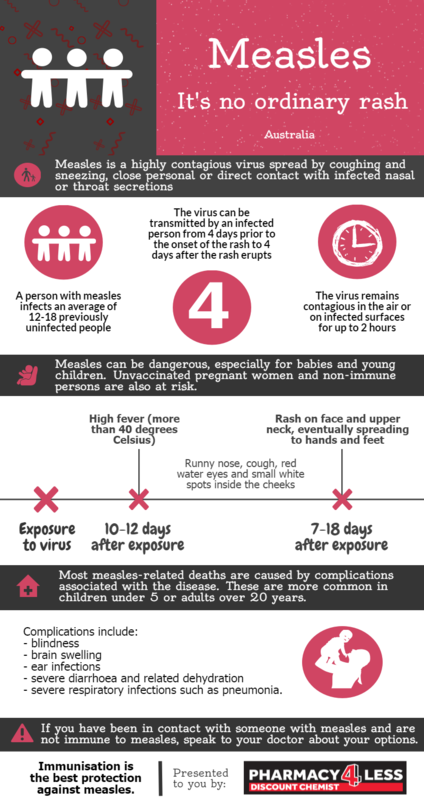 What are the symptoms and dangers of measles? Symptoms include fever, sore eyes and a cough followed three or four days later by a red, spotty rash that spreads from the head to the rest of the body. Measles complications include pneumonia, encephalitis, hearing damage and more. In some cases complications can be fatal. If you think you are infected you should telephone your GP or hospital to make arrangements and seek advice, rather than expose people in the waiting room to measles too. This new case brings the national total to 85 for the year and we’re only a little through April. Last year Australia only reported 103 cases for the entire year. In 2017 we had 81 reported cases across the country – we’re already ahead of that entire-year total. NSW Health Director of Communicable Diseases Vicky Sheppeard urged people to get vaccinated, but especially those who are travelling overseas. Dr Sheppeard also encouraged people to get a top-up jab if they were unsure of their vaccination status. Dr Sheppeard explained that preventive injections can also be given to highly-susceptible people up to six days after exposure to measles. If you have questions or concerns, contact your local public health unit for advice on 1300 066 055.